ERAVAP Crude is the solution for crude oil vapor pressure testing. It is tuned for measuring live or dead crude according to ASTM D6377, IP481 and GOST 52340. It includes optimized CCQTA methods for low V/L ratios. Curve measurements cover a temperature range from -20 °C to 120 °C over a wide pressure range with excellent precision and measuring stability. 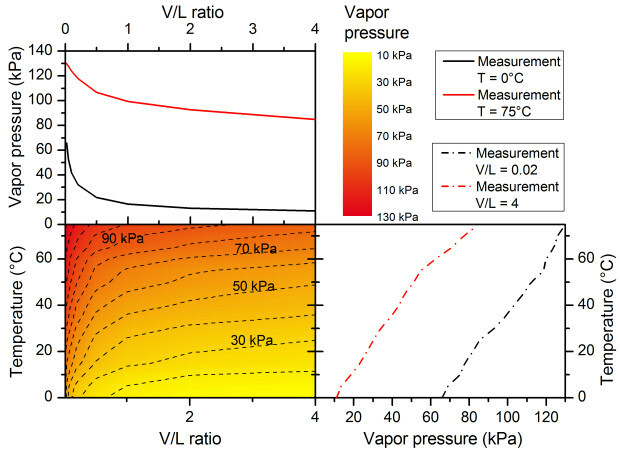 Vapor pressure of crude oil is a key parameter when planning the transportation of crudes through different climate zones. When performing crude oil vapor pressure measurements one has to bear the actual ambient conditions during transportation in mind. Is the crude transported in rail cars the headspace is approximately 5% where as a floating roof-top tank has nearly no headspace at all. This is important since the vapor to liquid ratio (V/L) and the storage temperature are highly influencing the vapor pressure of crude. This is especially true for live crude oil which still contains high amounts of volatile light ends. The graph on the side shows the influence of the V/L ratio and the temperature on crude oil vapor pressure testing. Measuring at the standard conditions of V/L = 4 and T = 37.8 °C the vapor pressure of the sample crude was approximately 40 kPa. 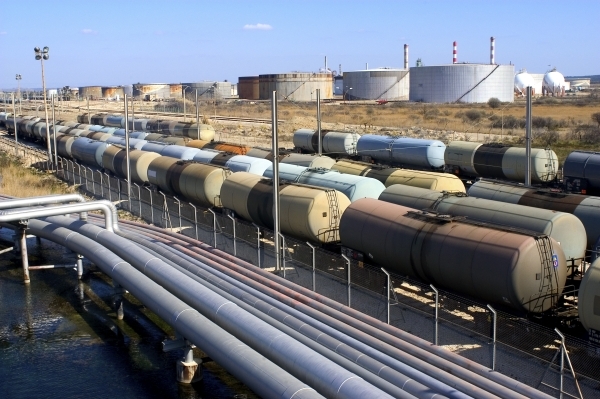 At a V/L ratio of 0.02 found in rail cars, trucks or ships already gives a vapor pressure of around 100 kPa. Assuming that this storage tank stands in bright sunlight heating its content to a temperature of 60 °C the vapor pressure rises even further to 120 kPa. The more light ends the transported crude contains the higher these effects will get. This highlights the importance to measure the crude’s vapor pressure under realistic conditions. ASTM D6377 allows to use a wide range of different parameters for crude oil vapor pressure testing. Thus it can be tailored to fit the parameters for most conditions. Studies by the Canadian Crude Quality Technical Association (CCQTA), however, showed that the thermal expansion of the samples makes measurements at very low V/L ratios difficult. 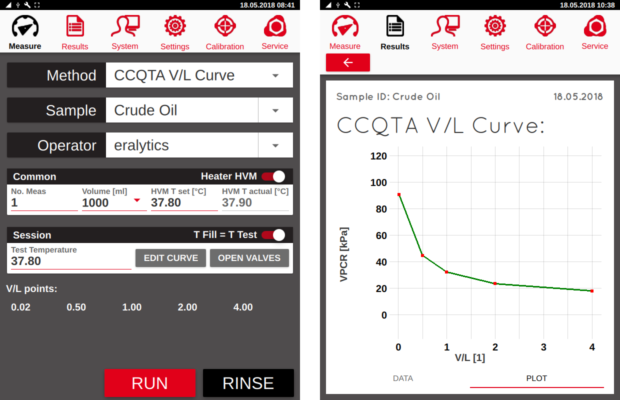 CCQTA prefers to analyze the V/L ratio curves at a specific temperature to judge the crude oil. 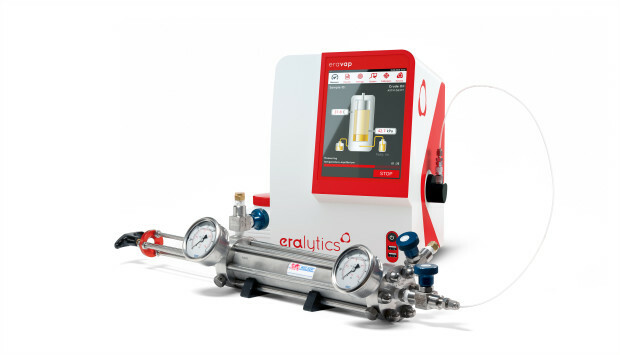 Eralytics’ found a solution for the thermal expansion issue in ERAVAP crude and therefore can measure accurate crude oil vapor pressures at V/L = 0.02. Additionally, curve measurement programs at various V/L ratios are available. 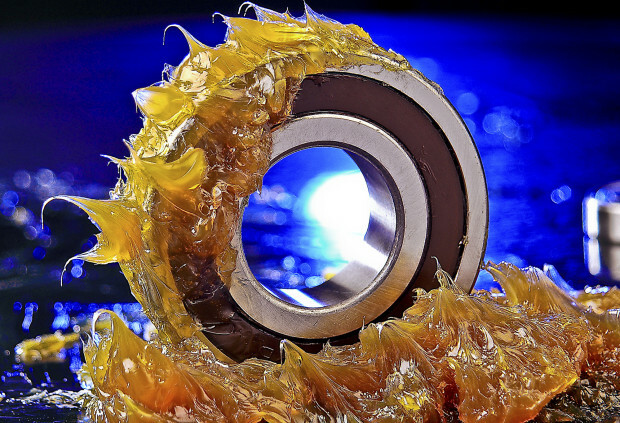 This makes ERAVAP crude the ideal choice for crude oil measurement applications. In May 2013 the U.S. EPA approved ASTM D6377 for the measurement of the true vapor pressure of crude oil under title 40 CFR due to its broad applicability at different conditions. ERAVAP crude comes with a pressure-tight connection inlet for quick fit connectors. This connectors make connecting floating piston cylinders (FPC) very quick and easy. Using such cylinders is vital for measuring live crude oils still containing high amounts of volatiles. If such crudes are measured from an open bottle the measured vapor pressure of this crude will be biased to the real vapor pressure since all volatiles will be lost. ERAVAP crude is also equipped with an inlet filter guarding the measurement cell from any sediments contained in the crude oil. With its built-in shaker motor it measures in full compliance with ASTM D6377. ERAVAP Crude directly draws up the sample into the measurement chamber by a piston. Sample take-up of more viscous samples naturally takes longer time until a viscosity where it becomes impractical. Heating up the sample prior to introduction reduces the viscosity and the filling procedure speeds up. However, during the measurement the sample sitting in the inlet and outlet tubing will cool down which possibly leads to a blockage of one of the tubes. With the new high viscosity module the inlet, outlet and all connecting tubes can be heated to temperatures of up to 70°C. This temperature is programmed from the measurement menu of the instrument and actively controls the temperature. 0 °C to 120 °C (32 °F to 248 °F) with Peltier technology. No external cooling is required. -20 °C to 120 °C (-4 °F to 248 °F) with additional low temperature upgrade (EV01-COOL). External cooling is required.